The two new teaser shots of the 2014 Dodge Durango are essentially the same image with one being almost entirely darkened to focus on the new taillight setup while the other is better lit, showing us the lines around the taillight and some addition features within the taillights. As you can see from the image on the right, we have chosen to feature the better lit shot as the new taillight setup looks just as awesome in both pictures. 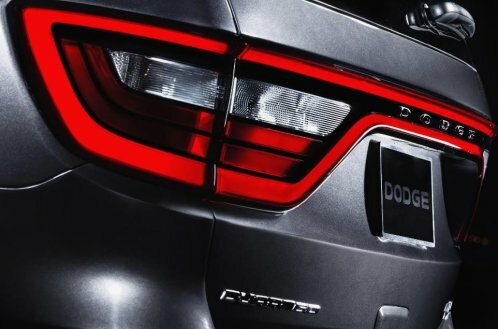 It has long been rumored that the 2014 Dodge Durango would receive a taillight treatment with a race track design similar to those found on the Dodge Charger and the new Dodge Dart and these first two teaser shots confirm those rumors. The race track single taillight design looks great on the Charger, it looks great on the Dart and from what we can tell in this single angle – it looks awesome on the Durango. Where the Durango taillight seems to differ from the similar design on the Charger and Dart is in the way that the assembly lights up. Both the Charger and Dart use an array of individual LEDs to backlight the race track lens and when you look at the taillights of those two sporty sedans when the lights are on – you can clearly see the many different bulbs under the lens. However, the taillight teaser of the new Durango makes it look as though the SUV version will have a far more continuous light stream around the edges, making it look like the light is coming from a single source rather than a ton of individual lights. The inner portions of the lens contain the backup lights along with a pair of smaller red lenses that could be turn signal indicators or they could be reflectors – or both. Aside from the new race track taillight, it looks like the 2014 Dodge Durango will receive some subtle sculpting changes similar to those seen on the 2014 Jeep Grand Cherokee along with a new handle design on the rear lift gate. We can expect that the lower portion of the rear end that is not shown in this first Durango teaser will have a design very similar to what we saw on the new Grand Cherokee when it debuted in Detroit. I absolutely love the aggressive, sporty look of the current Dodge Durango so I hope that the changes across the front end are not too significant. However, the current back end (including the taillights) don’t seem to fit with the aggressive nature of the front end…but this is a problem that will quickly be fixed with this great looking race track taillight for 2014. It really looks like it will make for a fantastic addition to the Durango. Little else is known about the 2014 Dodge Durango but rumors around the internet indicate that the Durango will get a refreshed front end as well with new projection headlights and fog lights accompanied by LED running lights (perhaps similar to the Grand Cherokee SRT8?) along with new wheel options. In terms of functional changes, we can fully expect that 2014 Dodge Durango will receive the new 8-speed automatic transmission with both the 3.6L V6 and the 5.7L Hemi V8 considering that the Durango shares much of the drivetrain lineup of the Grand Cherokee. There has been speculation that the new Durango will also offer the new 3.0L EcoDiesel V6 similar to the one in the Grand Cherokee and the upcoming Ram 1500 but there has been no company confirmation of a diesel powered Durango. It would make sense, considering that the two vehicles are so similar, but with Sergio Marchionne’s desire to eliminate redundancies among company vehicles – you have to wonder if the diesel will remain a Jeep-only option among the SUV lineup. Finally, the internet enthusiast communities suggest that the 2014 Dodge Durango will come with a new thin film transistor (TFT) customizable gauge cluster, similar to that found in the new Grand Cherokee and Dodge Dart along with the new 8.4” touchscreen infotainment system already at use in a variety of company products. It is also expected that the new Durango will feature a fresh Harman Kardon navigation system that will likely allow you to pump out the tunes as well. The 2014 Dodge Durango will debut at the 2013 New York Intentional Auto Show on March 28 during the company's 11:40am press conference.